Meet our friend, Kristen, owner of White Weddings! We recently had the opportunity to photograph and film her beautiful store, and a few of her stunning wedding dresses! White Weddings originally opened in February 2016, but they have been at their new location in beautiful downtown Farmington since September of 2017. Kristen first fell in love with helping brides find the perfect dress during her college days in 2007. Kristen is always interested in learning about a bride's personal style, her wedding day details, and getting to know the bridal party. These are just some of the reasons Kristen is so great at what she does! She pays attention to all of the details and, piece by piece, she helps bring your wedding dress dreams to life! 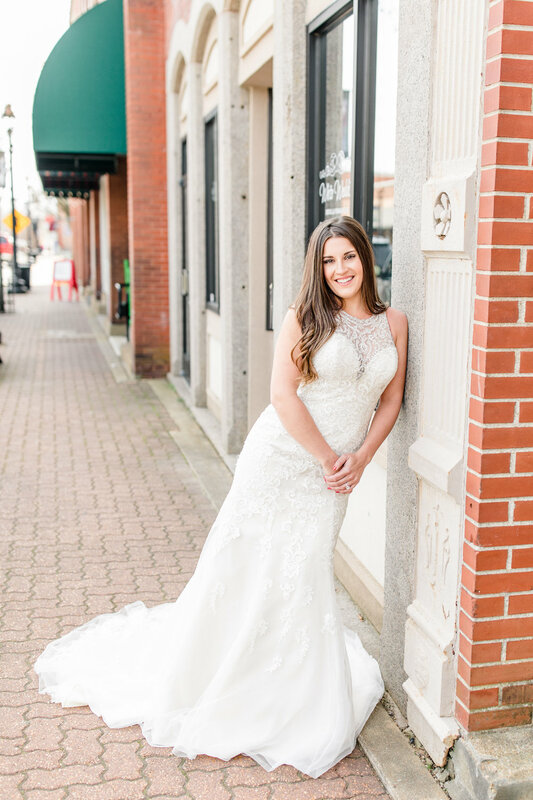 Kristen also enjoys having the store in downtown Farmington, and the character of the old building really makes a great backdrop for all the beautiful dresses! A one of a kind wedding dress absolutely requires a one of a kind place! Not only is the space that Kristen has worked so hard on to create beautiful, it's also the perfect enviornment where you can simply get a glimpse of how you will look on your wedding day! And, not to mention, you will receive excellent customer service! You are bound to say "Yes to the Dress" while working with Kristen or anyone else on the White Weddings team! White Weddings has almost any dress you could dream up... from simple and classy, to affordable, or heavily detailed and extravagant styles that are more unique. Like we mentioned previously, Kristen believes customer service is the best part of what they do. Kristen stated "I want brides to be able to come in and have a fun yet relaxed shopping experience!" Every bride should feel as good as she looks in a dress! Which can mean something totally different for each bride! So keep an open mind when trying on dresses and let White Weddings do what they do best, which is helping you find the perfect dress! Seriously......how does one look so pretty?!?!?! In a White Weddings Dress, thats how!!!! White Weddings is your destination for bridal and formalwear! 14 East Columbia St. | Farmington Missouri 63640. Walk-ins are always welcome, but to ensure adequate time for you shopping experience you may call (573-664-1500) or email (Info@whiteweddingsbridal.com) to make an appointment! And be sure to catch the footage of Kristen's beautiful store below! Tyler & Aubrie | Maternity Session! Ben & Rachael | 10 Year Anniversary!